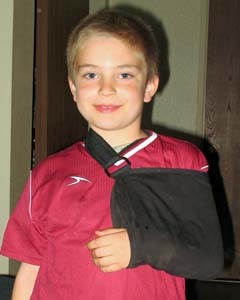 In the past year in a half, Big Guy has had a cast on his arm, an Ace on his ankle and, now, an arm in a sling. The causes were monkey bars, tripping at recess and falling off a bar stool in the kitchen, in that order. Feel free to insert a West Virginia University joke about his latest injury – what doctors think is a cracked bone somewhere around his elbow – from falling off a bar stool. Yes, it’s preparing him for the undergrad curriculum at my alma mater. I think he might even be eligible Advanced Placement credit. The problem is, if a kid’s going to miss football and karate for at least a week, he wants a dramatic explanation for why. Getting your feet tangled on a stool, then crashing to the floor and landing on your elbow doesn’t qualify. I don’t know what to tell him either, because he tends to suffer the worst trauma when he’s doing something completely mundane. There’s no reason to say “be careful” if he wasn’t being careless when he got hurt. It’s not that he doesn’t do plenty of crazy crap on a regular basis. This past weekend, he survived climbing to the top of a tree with ever-thinning branches and riding his bike down a steep, crumbly hill and crashing into a huge shrub. His knees suffered plenty, but it was nothing a little magic Bactine couldn’t cure. In fact I was reaching for the Bactine to apply it to a scrape he got after riding on the back of a friend’s bike – both of them crashed – when he tumbled off the stool. What lesson does that teach him? Ride tandem on a single bike and come up laughing, but sit down in the kitchen and wind up in the emergency room? I can honestly say that every single bone I’ve broken, including the most recent, was due to my own stupidity. That’s never been the case with Big Guy, though. Or maybe that is the object lesson.